Rey's Great Hexagon spans the sky almost from the horizon to the zenith when seen in late December from mid-northern latitudes. Watch for Mars intruding on this asterism. December is the month of the winter solstice, which a large part of mankind associates with such festivals as the Nativity. Among the many varied customs linked with this special season for thousands of years, the exchanging of gifts is almost universal. The moment of the solstice occurred on Dec. 22 at 1:08 a.m. EST. The sun, appearing to travel along the ecliptic, reached that point in the sky where it is farthest south of the celestial equator. Mother Nature herself offers the sky observer in north temperate latitudes the two gifts of longest nights and a sky more transparent than usual. One reason for the clarity of a winter's night is that cold air cannot hold as much moisture as warm air can. Hence, on many nights in the summer, the warm moisture-laden atmosphere causes the sky to appear hazier. By day it is a milky, washed-out blue, which in winter becomes a richer, deeper and darker shade of blue. For us in northern climes, this only adds more luster to that part of the sky containing the beautiful wintertime constellations. Indeed, it is seemingly nature's holiday decoration to commemorate the winter solstice and enlighten the long cold nights of winter. If you plan to be outside for a long period of time on these frosty, cold nights, remember that enjoying the starry winter sky requires protection against the prevailing low temperatures. One of the best garments is a hooded ski parka, which is lightweight yet excellent insulation, and ski pants which are better than ordinary trousers. And it is also important to remember your feet. While two pairs of warm socks in loose-fitting shoes are often adequate, for protracted observing on bitter-cold nights wear insulated boots. Soon after sunset, we can enjoy the sight of the brightest evening planet, Mars, shining brilliantly in the east-northeast sky. It fades ever-so-slightly since its Christmas Eve opposition brilliance to magnitude -1.5. Still, this is a trifle brighter than Sirius, the brightest star in the sky, which itself will be coming up over the east-southeast horizon soon after 7 p.m.
Saturn rises soon after 9 p.m. from the east-northeast, a bright yellowish-white interloper among the stars of Leo, the Lion. If you received a telescope as a holiday gift, you'll be able to glimpse Saturn's famous ring system with a magnification as low as 30-power. Currently, the rings are tipped only about 7 degrees to our line of sight, but as the winter progresses they'll be opening up a bit more. On Dec. 20, Saturn began its retrograde motion – reversing its course against the background stars and appearing to move back to the west toward Leo's brightest star, Regulus (which it will almost reach by next spring). And if you're still up in the predawn morning hours, you'll see Venus, the brightest of all the planets, emerging from the east-southeast horizon like a brilliant silvery "star" soon after 4 a.m.
High toward the south, also at around 10:30 p.m., we see what astronomy author Hans A. Rey (1898-1977) called a "Great Hexagon" of bright winter stars. To the south and a little east lies Sirius; up to the west, Rigel. Still higher, reddish Aldebaran; then at the north end of the circle, Capella. 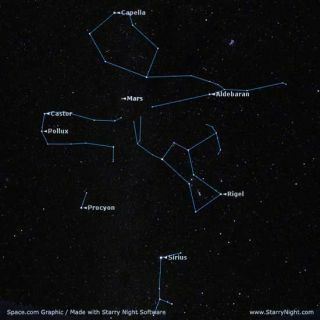 South and slightly east, we come to Castor and Pollux, the heads of the Gemini twins. Finally, south again to Procyon: in all, seven bright stars in six constellations. In the center of the hexagon, more or less, you have the ruddy star Betelegeuse, while soaring high above Orion, between the horns of Taurus is pumpkin-hued Mars; an interloper this winter season. This is the rich region that gives the winter sky its splendor.